I am one of those folks who doesn’t embrace “change” very easily…just ask my co-workers. My supervisor learned many years ago to slowly ease changes in my direction rather than giving me the full force effect all at once. I tend to recoil, retreat, and resist but I will eventually regroup although it isn’t an easy process for me. I suspect that a psychologist would analyze my responses and conclude that the majority of big changes in my early life were not good changes….therefore, I tend to associate “change” as undesirable and fearful. And since change is inevitable in our world, then I am very often easily twitter-pated (yes, it’s really a word). I’ve noticed that as I grow older, change seems to be increasingly more difficult for me, and my confidence in myself wanes with each passing year. We all have our demons to deal with, and two of mine are obviously CHANGE and CONFIDENCE. So in this hectic, whirlwind, ever-changing world where “what is new on Monday is obsolete by Friday” what hope is there for a twitter-pated soul like me? It so happened (by Divine Providence, I’m sure) that my pastor recently delivered a sermon that was meant specifically for me; it was all about that dreaded word “change”. As I listened and took notes I realized that change and confidence are really deeply interwoven—we can’t successfully accept change and adapt if we don’t have confidence in ourselves and God—and we can’t be confident in ourselves if we are unwilling to accept change and try new things, attitudes, and approaches. If we can succeed in something that is new to us, then we elevate our self-confidence. Patterns and routines are a good thing (yes, yes!!) but change is inevitable. Whatever changes come my way, I must remember that God is constant—He does not change. God is always by my side; He even goes in front of me and follows behind me. Don’t be concerned about what other people think; very often our fear of failing in a new and changing venture can hinder any attempts. Not trying is often easier than trying and failing and having other people witness the failure. Don’t be intimidated by others–there will always be someone who is better at doing something than you. 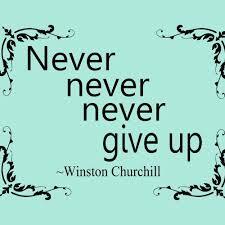 In my struggle with the enemy, I am always encouraged by the famous words of Sir Winston Churchill: “never, never, never, never give up” — spoken during World War II when England’s future looked dismal and bleak. When you and I meet again here next month, some big changes in temperatures and leaf colors will have occurred…..let’s you and I enjoy the change!